The older your baby gets, the more he/ she wants to explore. Now that the world and it’s contents can be manipulated a little more, so much wonder begins to unfurl so that your baby wants a taste of everything! Quite literally, in some cases. Your older baby’s senses are still at the forefront of their play, but now is the time to flex other skills too. Fine and gross motor skills, counting, letter recognition and hand to eye co-ordination are all essential parts of learning, alongside other skills such as positioning, verbal communication and sharing. All of this can be taught with play, so here are our top tips on sensory play for older babies and toddlers. Don’t be afraid of mess. 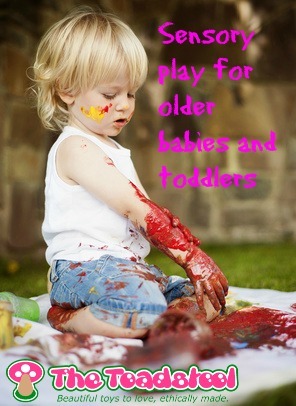 At this age, messy sensory play is a wonderful way for them to learn, so embrace it while you can! Invest in some floor covers if you paint, and a sand/ water table is another wonderful addition to the toy room if you have space. If in doubt, take the play outside. Its important to let the kids get stuck in so don’t let a bit of mess put you off. Let your child lead the play. By this age, your little one will have developed their own personality and character traits quite nicely, and they will take every opportunity to show them off too! If your child has particular interests, let them lead the play in that direction. You can always direct the play a little bit but ultimately the most enjoyment will come from your child’s lead. Incorporate learning into as many activities as you can. You don’t need to turn play time into lesson time, but be aware of your child’s developing knowledge and try to answer as many of his/her questions as you can. You may find that lots of toys and activities are guided towards learning a specific aspect anyway, but there are always ways that you can extend the learning if you want to. Use the shovel excavator as part of a small world investigation into people that help us. Kit your little ones out in high vis jackets and shovels and talk about the people who dig up roads and build houses etc. If you have a little one that loves diggers and trucks etc, this one is perfect for you. 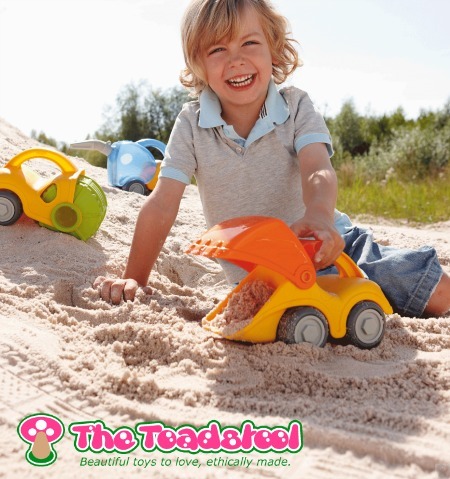 Alongside the imaginative element of this toy, you can also talk about the tracks that the truck makes in the sand. Can you make patterns? Can you drive left? Right? Round and round? Compare the truck to other wheeled toys-which has the biggest tracks? How much sand can you scoop up? Let your child guide the play, but don’t be afraid to ask questions that will lead the thinking elsewhere too. The brick layer set is a wonderful addition to any sand pit and one that the kids will love to spend time figuring out. Hand to eye co-ordination skills are being flexed here, as well as balancing and construction. With that comes concentration and of course patience! Can your little one build a wall to keep out the enemy soldiers? Can you scoop enough sand in your excavator to fill the bricks to make a house? So many ways to play! We couldn’t resist the big bakery set and the pat a cake set either! Take the play kitchen outside and let the kids create a picnic with a difference! How many cakes can you make? Can you cut the cake in half? Can you decorate your cake? Alongside the sand toys, use the sand in other ways too. Digging is great for gross motor skills and sand also lends itself quite well to mark making with tools or fingers too. Musical instruments. We love the Haba drum and the Haba chimes too. Water play. 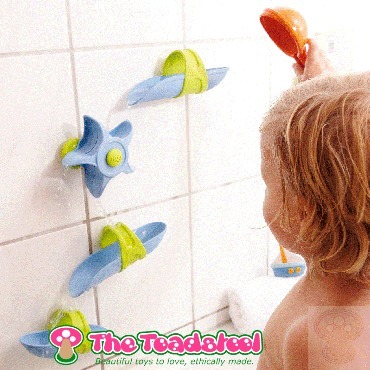 The new wooden bath toy range is wonderful, but we also love the ball track for the bath or shower too. What are your toddler’s favourite toys right now?